Winner of the 2018 Kirkus Prize, A PEN/Hemingway Finalist, A New York Times Notable Book of 2018, An Indie Next SelectionA Best Book of 2018 at Elle, Marie Claire, Refinery29, Bustle, Buzzfeed, BookPage, Bookish, Mental Floss, Chicago Review of Books, HuffPost, Electric Literature, Amazon Editors', A.V. Club, Jezebel, Vulture"A fierce debut from a writer with seemingly boundless imagination. . . A stunning, audacious book with a fresh take on both office politics and what the apocalypse might bring." --Michael Schaub, NPR.orgMaybe it's the end of the world, but not for Candace Chen, a millennial, first-generation American and office drone meandering her way into adulthood in Ling Ma's offbeat, wryly funny, apocalyptic satire, Severance.Candace Chen, a millennial drone self-sequestered in a Manhattan office tower, is devoted to routine. With the recent passing of her Chinese immigrant parents, she's had her fill of uncertainty. She's content just to carry on: She goes to work, troubleshoots the teen-targeted Gemstone Bible, watches movies in a Greenpoint basement with her boyfriend.So Candace barely notices when a plague of biblical proportions sweeps New York. Then Shen Fever spreads. Families flee. Companies cease operations. The subways screech to a halt. Her bosses enlist her as part of a dwindling skeleton crew with a big end-date payoff. Soon entirely alone, still unfevered, she photographs the eerie, abandoned city as the anonymous blogger NY Ghost.Candace won't be able to make it on her own forever, though. Enter a group of survivors, led by the power-hungry IT tech Bob. They're traveling to a place called the Facility, where, Bob promises, they will have everything they need to start society anew. But Candace is carrying a secret she knows Bob will exploit. 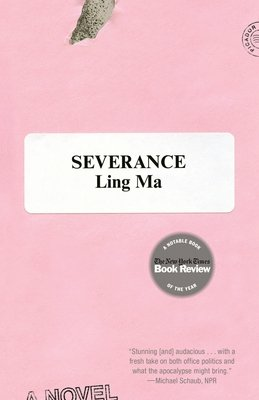 Should she escape from her rescuers?A send-up and takedown of the rituals, routines, and missed opportunities of contemporary life, Ling Ma's Severance is a moving family story, a quirky coming-of-adulthood tale, and a hilarious, deadpan satire. Most important, it's a heartfelt tribute to the connections that drive us to do more than survive. "Severance" offers blatant commentary on "dizzying abundance" and unrelenting consumption, evolving into a semi-surreal sendup of a workplace and its utopia of rules, not unlike Joshua Ferris's "Then We Came to the End." Ma revivifies this model.... Ma conjures the expat protagonist of Joseph O'Neill's "Netherland," who argues that "we are in the realm not of logic but of wistfulness." ...[a] gripping and original turducken of a novel... Ma manages to make both periods  pre- and post-apocalypse  fascinating and distinct from one another.... The swift changes in mood between the lyrical past and the horrific present lend the novel texture and a sense of propulsion and suspense.